It was Kev’s turn to chose the style and draw up a recipe for our third Brew in a Bag beer. One of his (many!) aims from this homebrewing business is to work on good, solid beers made with minimum fuss and, within reason, minimal expense. Table beers if you will. 10 litres of tasty wort had some Mangrove Jacks Burton Union yeast pitched in it and, while fermentation was a little sluggish to get going, there were visible signs of krausen just over 12 hours later. So a very simple recipe for a, hopefully, very tasty beer. Simple that is until the slight twist we have planned. Once fermented, some or all of it (still undecided) will be transferred to secondary where it will be joined by some beautiful smelling burnt orange. Why not, eh? 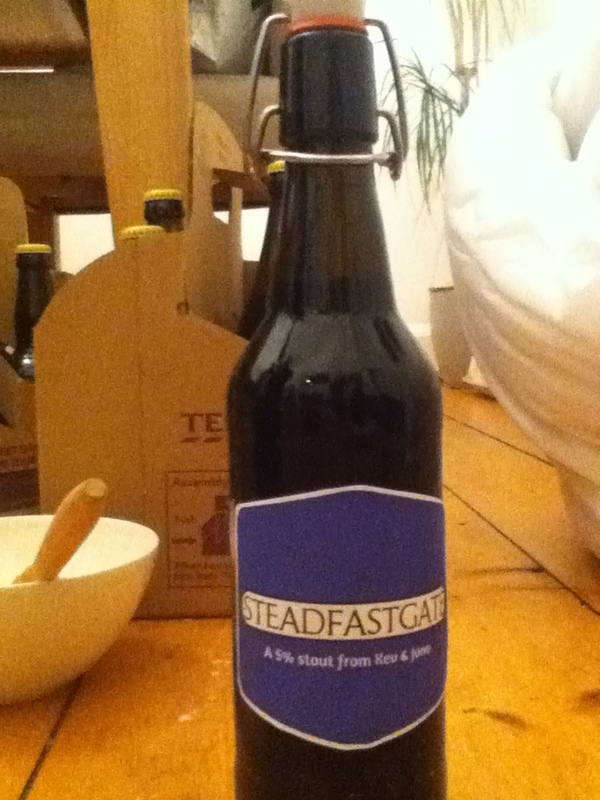 This was kindly given to us by Schuyler (@slward2009) at our last visit to the Homebrew Club organised by @brewstore. And while it’s there, we’ll also dry hop it… seems rude not to. Will probably just stick with First Gold and/or Fuggles for that. Any suggestions on hop varieties or quantities to use per litre would be gratefully received, though. That’s it for now on the beer. For anyone interested in our BIAB process, we didn’t change too much this time round. As we had too much wort last time, we cut back the water quantities a little. 6 litres for the mash and 8 litres for the sparge ended up spot on for our pan. 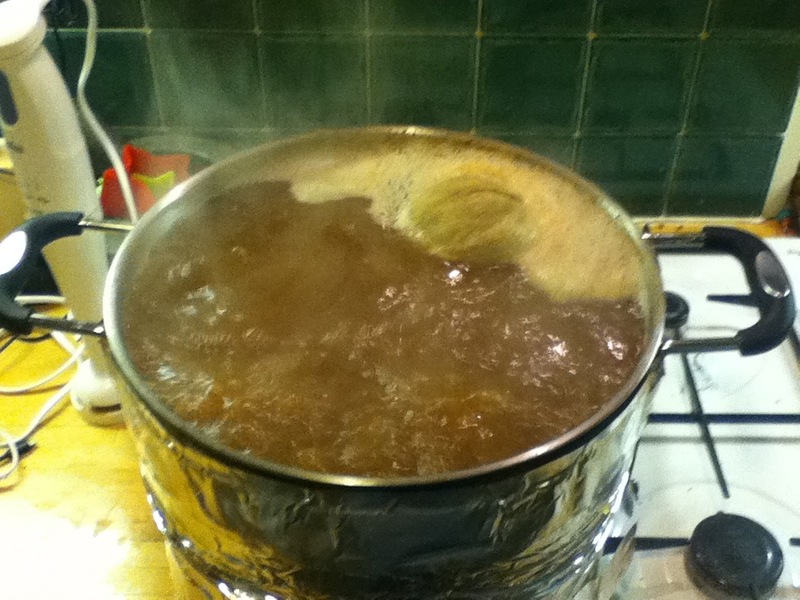 You can see our nice full ‘kettle’ hitting the boil below. We also continue to battle with maintaining mash temperature. 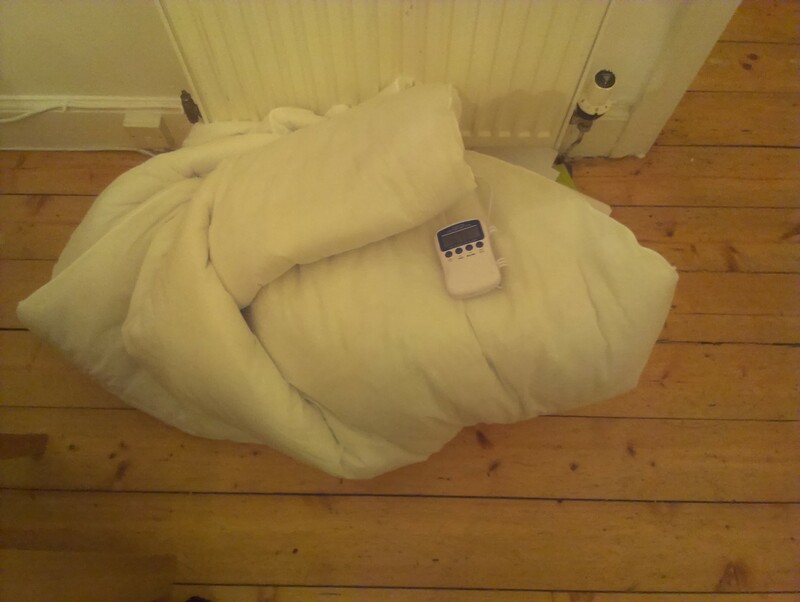 The purchase of a 13.5 tog duvet (see below) definitely helped this time round, but we still needed to give it a wee blast of heat after 45 minutes. More insulation to be acquired before the next brew then! That’s it from our last brewday. Thanks for reading and well done if you’ve made it this far! Any and all comments welcome, of course. This brew was left a good two weeks, pretty much untouched, in primary at which point I’d expected it to be done. Having taken a hydrometer reading two days before intended transfer for dry hopping, though, it was still a bit high at 1016. Following lots of helpful suggestions from @100yojimbo, @FourStringDave, @AdyGoodrich, @TheDaveToEndAll & @the_elite, the time-honoured ‘rouse it and warm it up’ technique was deployed. This, worked really well and we finished below target gravity at 1010. The whole batch was dry hopped (2.5g/l) for 5 days with Cascade (10g), First Gold (10g) and Fuggles (5g). A generous half of this was bottled, before we added Schuyler’s burnt orange for another 5 days to the rest. End result was 8 bottles of regular ESB, 6 bottles of the burnt orange version and a week and a half with a delightful smelling food recycling bucket. This entry was posted in Uncategorized and tagged BIAB, ESB, homebrew, labels on March 13, 2014 by bagboilbeer.